One should never consider tooth loss lightly and must try to get a replacement at the earliest. To address the issue of tooth loss, your dentist will most likely recommend these tooth replacement options: partial, bridge or implant. Partial denture is a removable dental appliance recommended by your dentist to replace one or more missing teeth. It comprises a metal framework to which a gum colored plastic layer is attached. Onto this structure artificial teeth are fixed. It takes few days to get accustomed to partial dentures. It has to be taken out before sleeping. It has to be cleaned regularly on a daily basis with a denture cleansing solution. When is a Partial ideal for teeth loss? When more than one tooth on the same side of the arch or many teeth on both the sides of the arch need replacement. When only a temporary appliance is required. When cost factor is the first priority. Partial dentures are the most affordable dentistry option for loss of teeth. When the individual can maintain his/her oral hygiene. When support to the periodontally weak teeth is required along with replacement of missing teeth. Partial dentures are the least expensive teeth loss replacement option. They are bulky and require a lot of coverage as they derive support from the adjacent teeth and structures. Partials are a non-invasive dentistry procedure. They are quite uncomfortable owing to their size mainly. Though they depend on the neighboring teeth for support, they are not affected much by the condition of the neighboring teeth. Many patients find it difficult to chew or speak while wearing a partial denture. They are easily repairable with denture reline. Aesthetics could be compromised when the gum colored acrylic becomes visible while smiling. How long does it take to replace my teeth with a Partial Denture? To replace your teeth loss with a partial, you need at least two visits to the dentist. The first visit to the doctor is the impression. The second visit is the Partial installation. It would take around 1-2 weeks in between to make the partial. Some partials, such as the Flexite Partial, can be available as early as the next day from impression. Tooth Loss Options: Dental Implant vs a Bridge. A bridge (top) requires two crowns on existing teeth to support a replacement to your missing tooth. A dental implant (bottom) will directly replace the missing tooth with a titanium screw to support a crown. 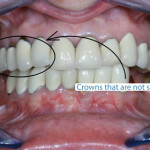 Two crowns on abutment teeth (teeth present adjacent to the missing tooth). 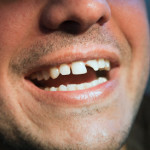 For example, if you lose a tooth in between two teeth, you can have a 3 unit bridge. Tooth number 1 and tooth number 3 could be Porcelain Crowns placed on top of the existing teeth. Tooth number 2 is the Pontic that goes on the middle to replace the missing tooth. Tooth number 2 is attached to teeth number 1 and 3. When is a Dental Bridge ideal when you lose a tooth? When the abutment teeth are sound periodontally (which means they are not loose and have good root structure support). When the space of missing teeth is narrow. When the individual prefers fixed / permanent solution to tooth loss versus removable (Partial Denture). When the individual is an epileptic patient – A removable denture can cause choking during the bouts of unconsciousness. When the individual is unable to take care and maintain a removable partial denture. E.g. mentally compromised or physically handicapped. Dental Bridges give a natural feel. The sound tooth structure of the abutment teeth has to be sacrificed for tooth preparation. It doesn’t affect your speech, and you can chew better. With poor oral hygiene, the bacteria thrive in the area underneath the dental bridge and cause infection of gums or even tooth decay. Most of the times, the bridge can be fixed within 2 appointments. Some people have complaints of tooth sensitivity due to removal of sound tooth structure. How long does it take to replace a missing tooth with a bridge? If the extraction wound is healed, you can get your bridge within 2 – 5 days. Some dental clinics who use a CAD / CAM Dental Milling machine can deliver your bridge the next day. A dental implant is an artificial substitute of a tooth root which is usually made out of titanium or titanium alloys. It is surgically inserted into the jaw bone by your implant dentist. Once the process of osseointegration (fusion of implant to jaw bone) is complete, the implant becomes ready to provide support to a crown, bridge or complete denture. 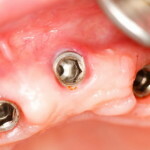 When is a dental implant ideal for tooth loss? Tooth implants preserve the natural dentition. There is no need to reduce the adjacent tooth structure as with a bridge. Implants are the most expensive among the 3 missing teeth treatments. They are independent structures so the chewing forces do not fall on the adjacent teeth. The introduction of implants into the jaw bone is done by means of a surgery. They hold the jaw bone and prevent the resorption (bone loss). If you have insufficient jawbone, you may not qualify for a dental implant. However, many oral surgeons usually can rebuild your mouth bone. They are a long-lasting tooth loss solution. Dental implants give a better taste sensation and function just like a normal tooth. How long does it take to replace my lost tooth with Dental Implants? It can take anywhere from 3 to 6 months to finish a full tooth replacement with implants. The duration depends on the rate of healing and osseointegration after the surgical insertion of the dental implants. No stress on neighboring teeth. Looking for an affordable tooth replacement? Contact Dayo Dental to save 50-70% on the cost of your dental work by travelling to Mexico.